Basil is so abundant this time of year in the garden. 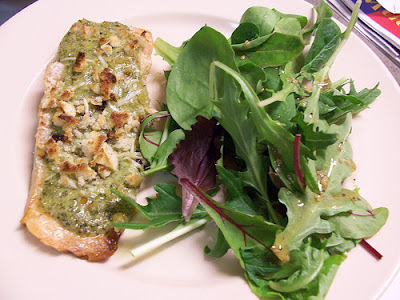 Here is a delicious recipe for basil pesto that goes perfect on top of flaky cod. Any remaining pesto can be frozen for later use! Preheat oven to 350 degrees. Place pesto ingredients into a food processor and pulse until thick but completely pureed. Place the fish in a baking dish lightly drizzled with olive oil. Smear the pesto onto the fish in an even thin layer (you can go as thick or thin as you like, I had about 3 tablespoons of pesto leftover). Top with bread crumbs and bake for about 20 minutes or until fish is flaky. You can also cook the fish over a grill. Preheat grill to medium heat and place fish into a heavy skillet with a lid. Bake covered for about the same amount of time removing lid for the remaining 5 minutes to allow bread crumbs to crisp.